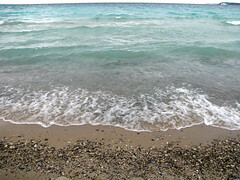 The Lake Michigan water at Good Harbor back in February was a color I hadn't seen before. Maybe it's because I never went down there during the winter when I lived there. That is the color of cold.